Hello and Happy Tuesday! 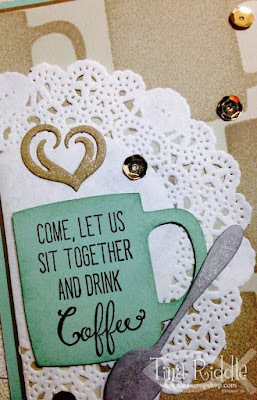 I hope your week is off to an awesome start! 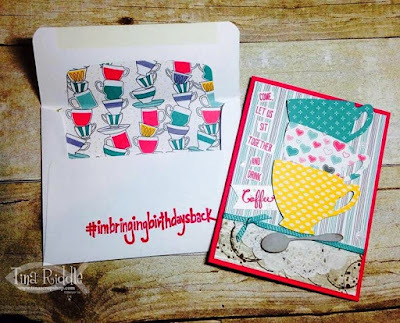 Since today is Tuesday, it's time for another Stamp, Ink, Paper Challenge! Today's Challenge is all about Welcoming Baby! 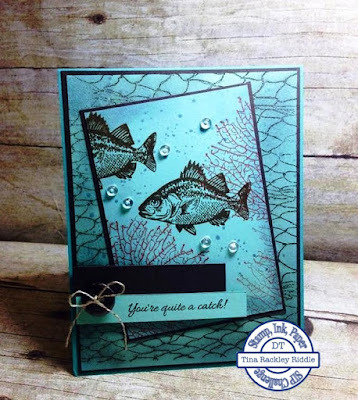 Since I have a new grandbaby scheduled to make it's arrival the end of May, this is a super fun challenge card for me to make. What are we having?? We will be having our 6th granddaughter, Blakely Addison Rose. Every one of them are a precious gifts from God! 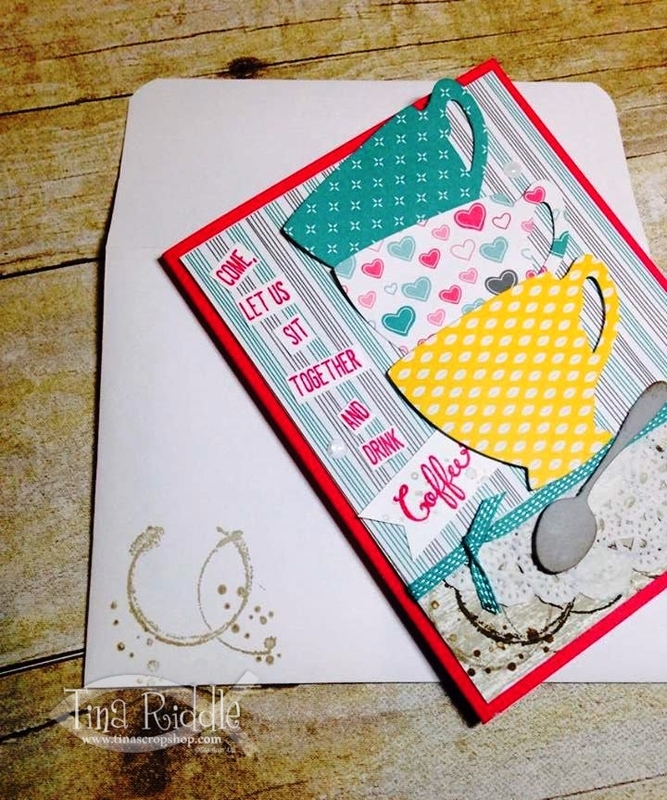 So here's my super adorable card using the new to me, Stampin' Up! 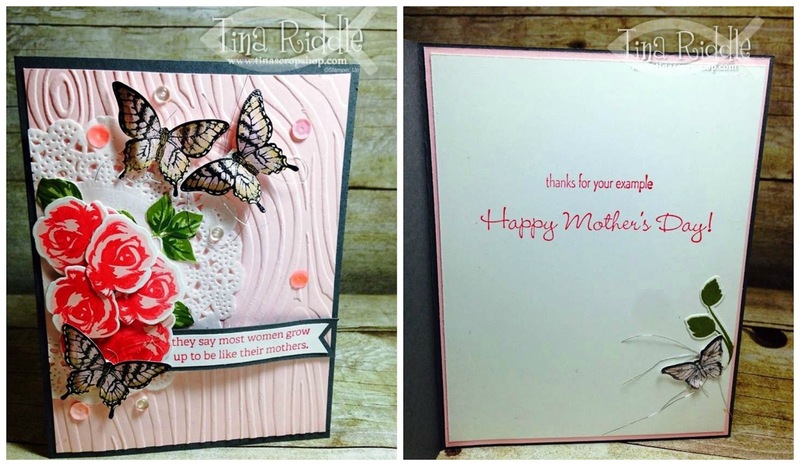 Stamp set "Made with Love" and coordinating "Baby's First Framelits Dies". 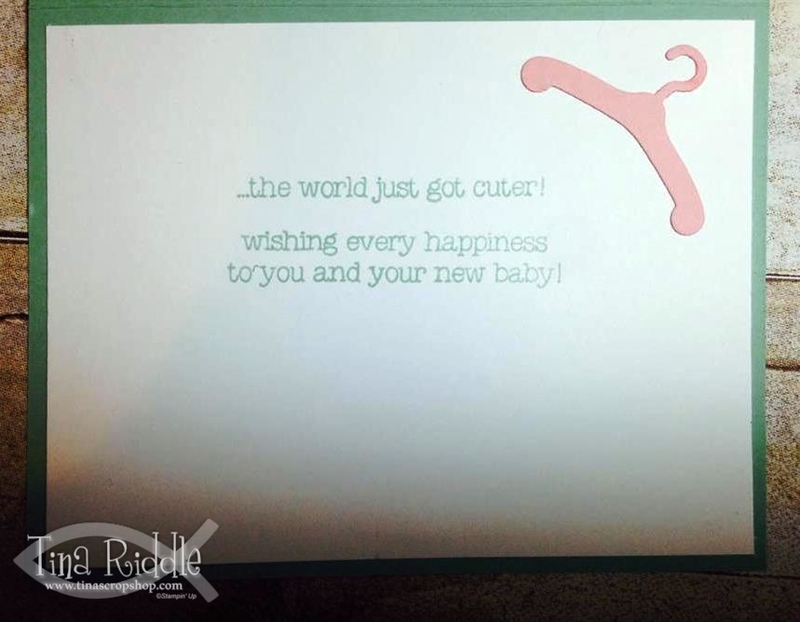 My sweet friend Andrea recently told me that every cardmaker needs one good baby set so I took her advice and ordered these and I am so happy I did! Aren't these sentiments just adorable?? I love them! Hello and Happy Tuesday! I hope you're week is going good so far! I always feel once I survive Monday, I'm good to go! 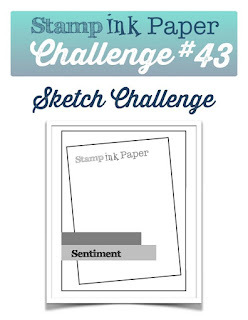 lol Well since today is Tuesday, I'm sure you know it's time for another Stamp, Ink, Paper Challenge! This week we have a Fabulous Inspiration Photo! 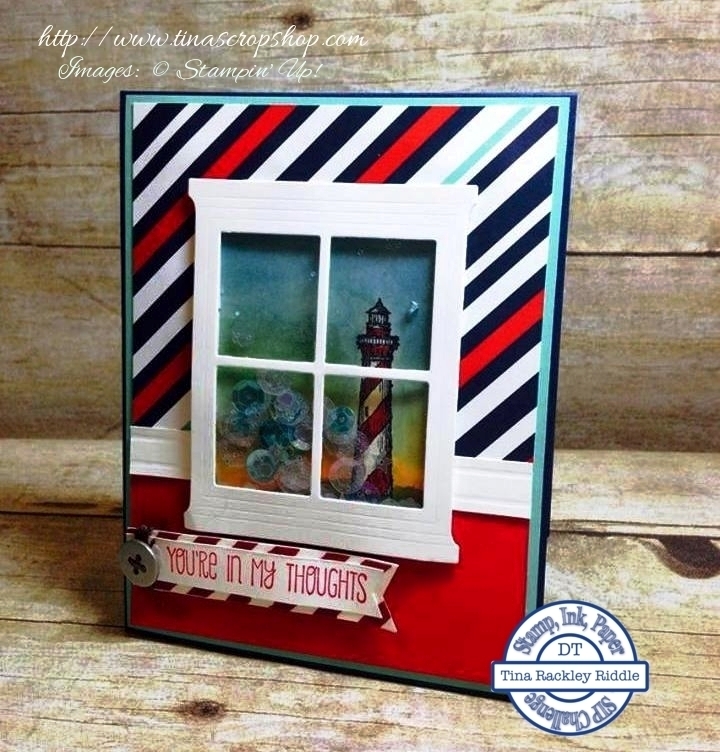 I love my nautical cards so I was all about this one! I wanted to try something a little different this time. Here's what I came up with! 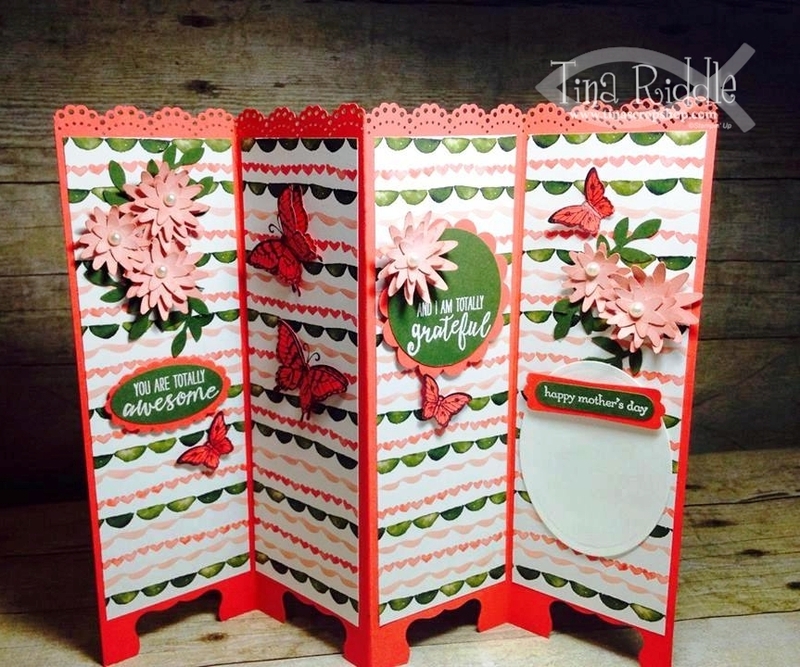 Tip: For the Chair Rail, I used a strip of Whisper White Cardstock and scored it on my Score Board to make it look like wooden trim. Hello! Hope your April is awesome and if it hasn't been, I hope it gets that way soon! I know a lot of folks around the Northern part of the United States have been having snow! That seems crazy here in Mid April! Let the Spring begin!!! 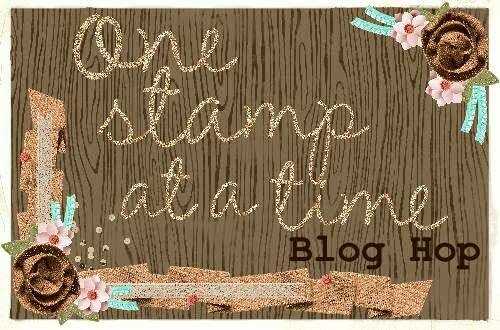 Well as I'm sure you've seen from the header, it's time for another One Stamp At A Time Blog Hop! 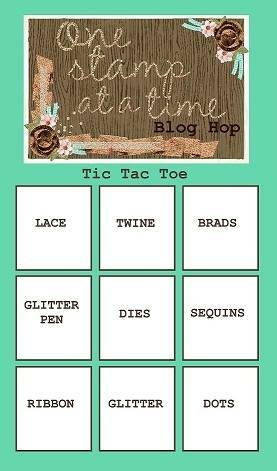 This month we're hopping around for some Tic-Tac-Toe Inspiration! If you've already been hopping you should have landed here from the fabulous blog of Alisa Tilsner! If you missed it, believe me you'll want to make sure you check it out! She is awesome! 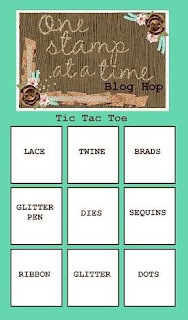 So before I show you my card and project I'll let you take a look at this fabulous Tic-Tac-Toe Board! Here's a closer look at my card..
For my background I did a super fun technique that I learned from the crazy amazing Dena Rekow! 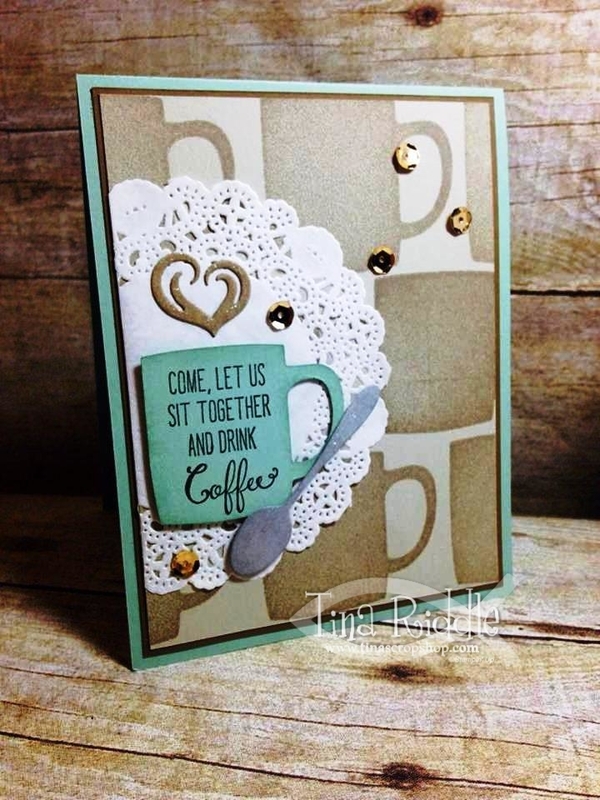 Dena shared that you can make stamps from your dies by cutting fun foam! She totally rocked this technique in her video! To watch it and believe me you WANT to watch it, just click here! So now that you've watched the video.. you did watch it, right?? Here's how I made my card.. 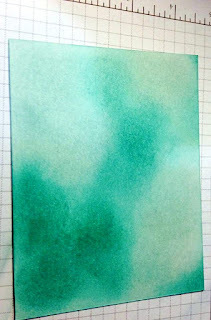 I started off with a 11" x 4 1/4" piece of Mint Macaron cardstock that was scored at 5 1/2". 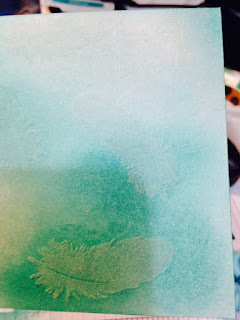 My next layer was a thin layer of Soft Suede cardstock that measured 4 1/8" x 5 3/8". The top layer was a 4 x 5 1/4" piece of Sahara Sand cardstock. 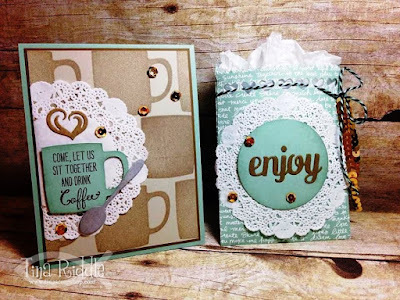 I cut a piece of fun foam out with the mug die cut from the Cups and Kettle Framelit Dies and stamped it tone on tone with Sahara Sand Ink. 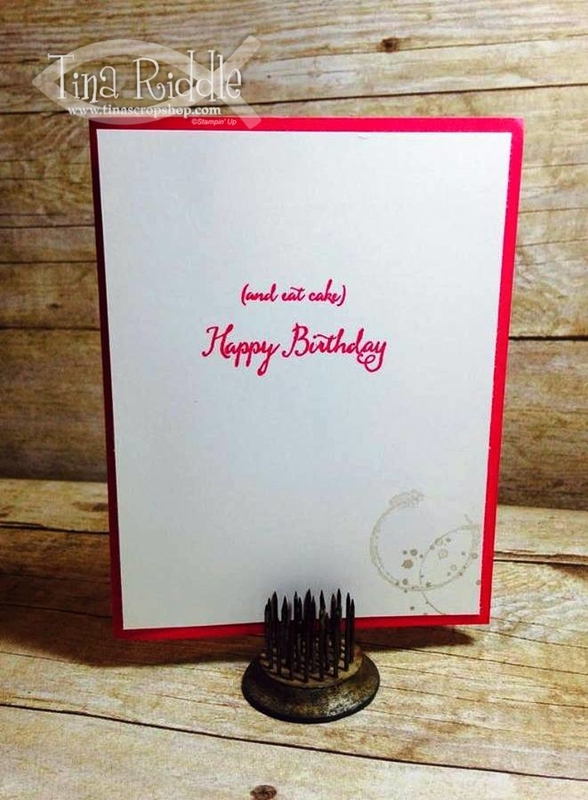 I put a white Tea Lace Doily onto the left side of my card, letting a portion hang off the layer and wrapping it around the back. I adhered the doily with Snail adhesive. Next I cut out the same mug in Mint Macaron cardstock and sponged the edges tone on tone. 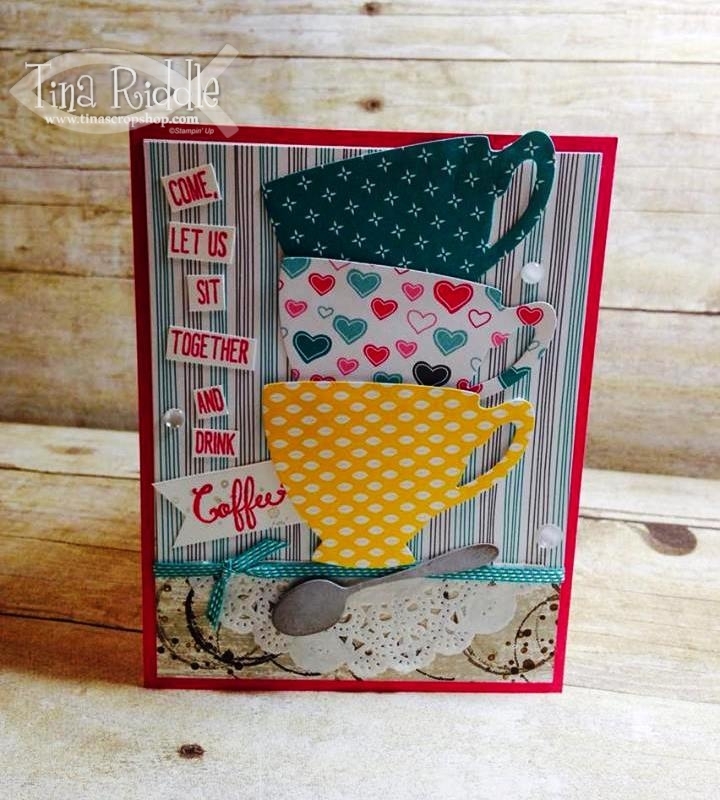 The sentiment on the mug was from the Balloon Celebration Stamp Set and was stamped with Early Espresso Ink. After stamping the sentiment, I adhered the mug with stamping dimensionals. I cut out the heart shaped steam out in Soft Suede. I used a clear Wink of Stella glitter pen to add some shine to it! I used the Fine Tip Glue Pin to adhere the steam. If you haven't tried that adhesive out, you should! The spoon was cut out in Smoky Slate and sponged tone on tone on the edges. 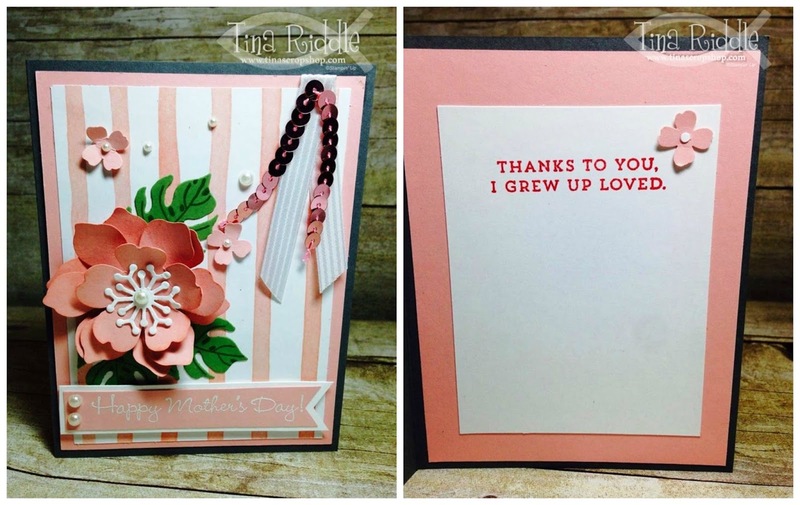 I also used some of the Wink of Stella glitter pen on it. I adhered the bottom of the spoon with a Dimensional and the top part with a glue dot. I added some gold Pretty Pink Posh sequins to finish this one off! 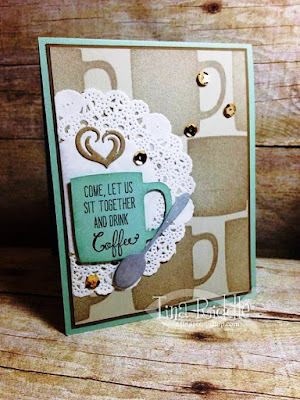 I thought this card would be super sweet for a come on over and drink coffee and eat cookies card and believe me I could give that to many of my friends! 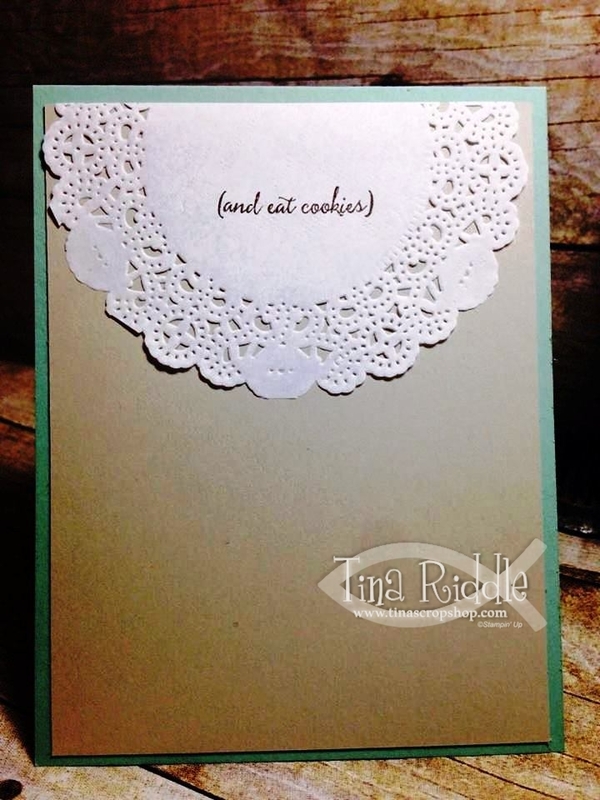 lol And wouldn't a cookie look super cute in the little treat bag?? 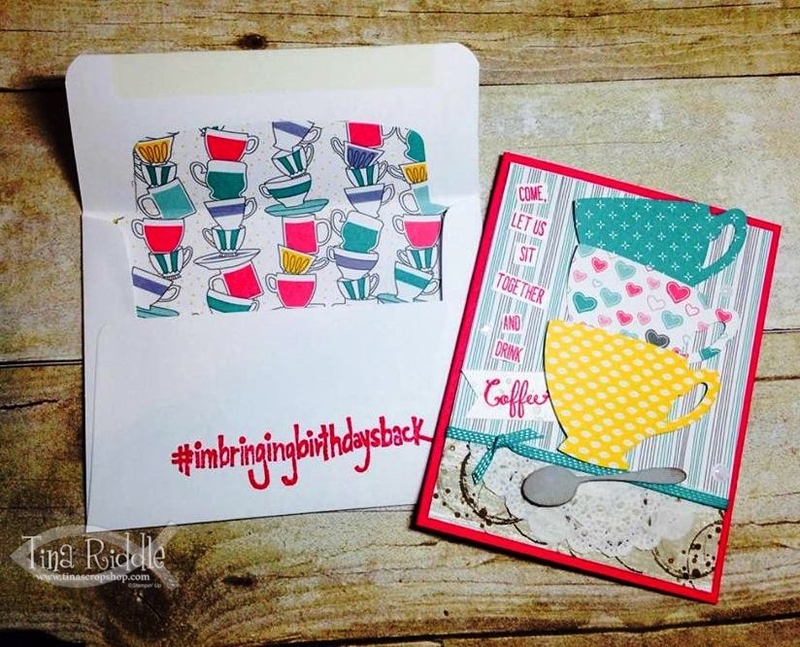 The Treat Bag is from the Stampin' Up! Mini Treat Bag Thinlits Dies. 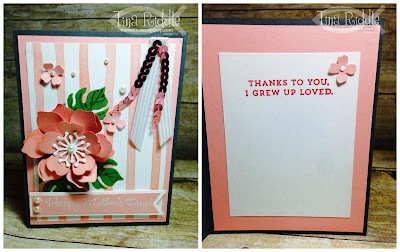 I cut out the bag using the Stampin' Up! 2015-2016 New In Color Collection Background Stack in Mint Macaron. I used the heart strip that comes in the Treat Bag Dies to cut a strip along the front. The bag was glued using Stampin' Up! Fast Fuse. It is a super strong adhesive and great for adhering boxes and treat holders! After assembling the treat holder, I ran some Mint Macaron and Black twine through the hearts and added a strip of Stampin' Up! Gold Sequin Trim before making the bow. I adhered a white Tea Lace Doily onto the front of the bag. 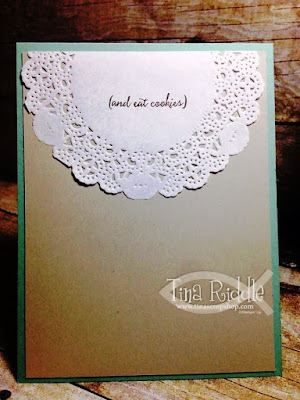 I punched a 2" circle from Mint Macaron cardstock and sponged the edges tone on tone. I adhered it to the middle of the Tea Lace Doily with Stampin' Up! Fast Fuse. The "enjoy" sentiment is another die that is part of the Treat Bag Thinlits. 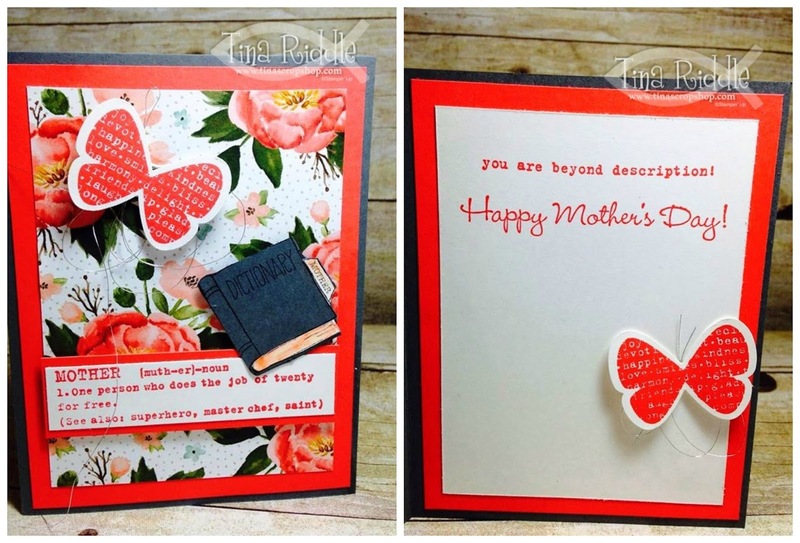 I cut it out in Soft Suede Cardstock and used my Wink of Stella Glue Pen on it prior to adhering it with my Fine Tip Glue Pen. I added three Pretty Pink Posh gold sequins and put some white tissue paper inside the bag and that was it! I was super happy with how cute it turned out! Hope you've enjoyed my projects and are ready to hop over to the next blog of the Super Talented Stampin' Up Artisan Marisa Gunn! She is soooo fabulous! Just click the next button! If you happen to get lost along the way here is a list of all of our awesome OSAT bloggers! Tina Riddle - That's me!! Wow! 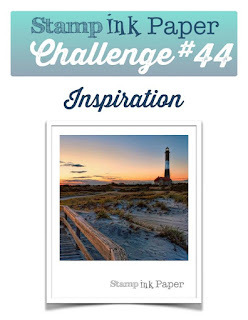 Can you believe Stamp, Ink, Paper has alredy had 42 challenges now?? It seems like the time has flown by! This week is probably my favorite color challenge we've had! 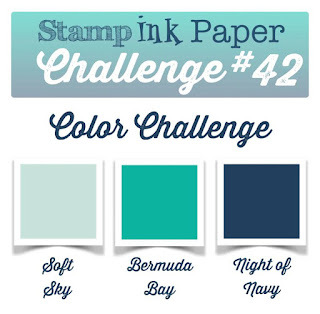 I absolutely LOVE the color combination of Soft Sky, Bermuda Bay and Night of Navy! This week's card is a very special birthday card for my sweet friend Nikki who has a birthday on the 10th! For the emboss resist panel I started with a 3 1/4" x 5" piece of Shimmery White Cardstock. I began sponging Soft Sky and Bermuda Bay Ink randomly. 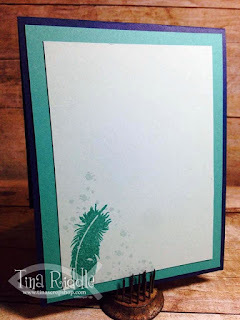 After my sponging was completed, I stamped the feather stamp with Versamark from the "Lovely Amazing You" stamp set in different directions onto the sponged cardstock. 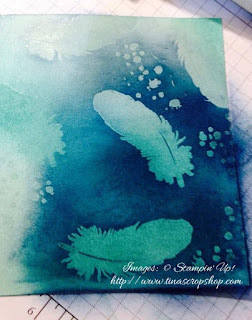 I then sprinkled clear embossing powder over the feathers. 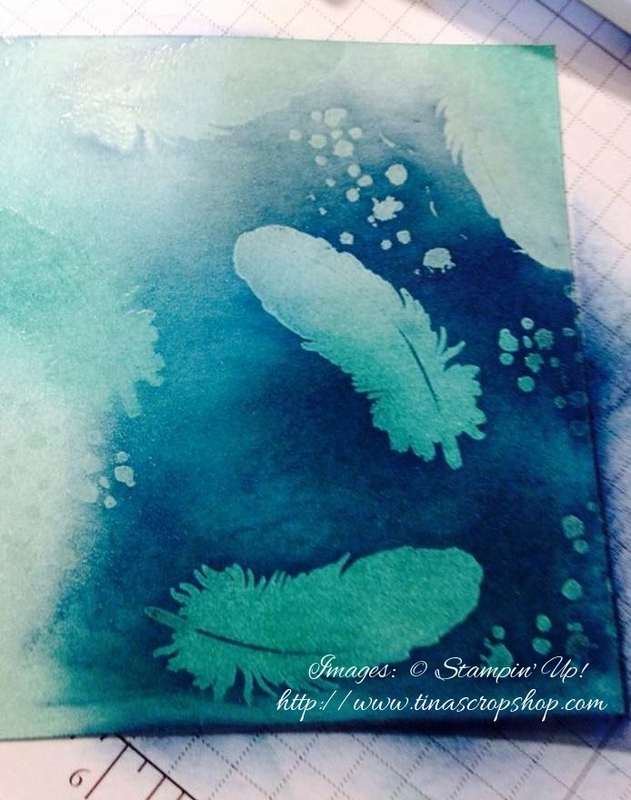 I embossed the feathers until they were completely shiny. Next I clear embossed some of the splatters from the "Awesomly Artistic" stamp set. Once those were also shiny and completely embossed and then cooled down, I began sponging the Night of Navy Ink over the entire piece. Once I had the Navy over it all, I used a paper towel to remove the traces of Night of Navy that were over the embossed feathers and splatters. I layered the panel onto Soft Sky Cardstock. 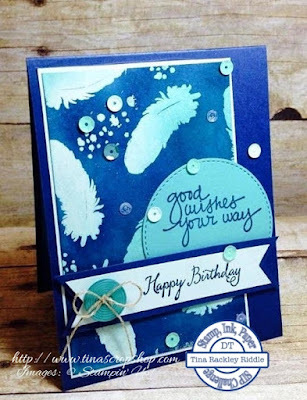 I stamped the sentiment "good wishes your way" in Night of Navy ink onto a Bermuda Bay stitched circle. The good wishes your way sentiment is also from the Lovely Amazing You stamp set. 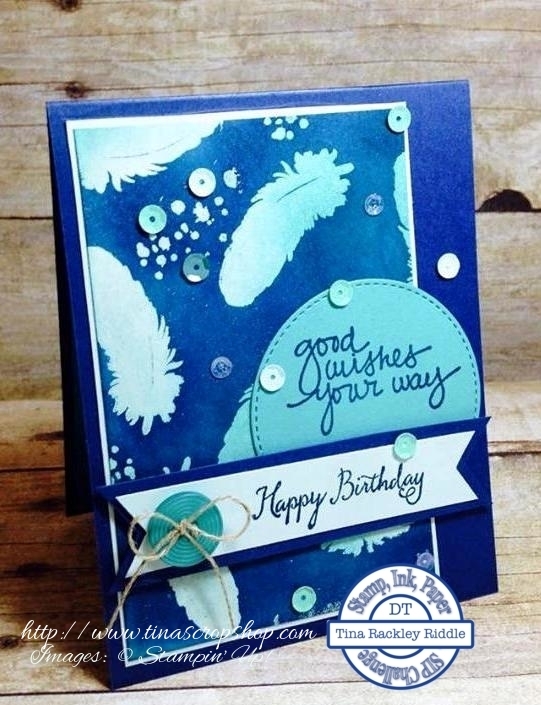 I added a Night of Navy and Soft Sky Banner with "Happy Birthday" from the Balloon Celebration Stamp Set. I also added a Brights Collection button in Bermuda Bay threaded with some linen thread and tied in a bow. Last but not least I added some Doodle Bug Sequins.